You might think there is nothing extraordinary in that title, except, I’m afraid of horses. I know they can be very nice, very large, creatures. Back when I worked in the county mental health office, I used to take children to riding therapy. I saw children who, for reasons I won’t share, had withdrawn so deeply into themselves that they weren’t socially functional suddenly become animated…daring…courageous! In one session they went from barely staying seated to standing fearlessly on the horse’s back as it gently jogged around the ring. I was still scared, even as I witnessed the transformation of those children as they piled back into the transport van, smelling horsey and sweaty and smiling, perhaps for the first time that week. I’m still scared. Let me put it this way, a friend recently suggested we go give some treats to local horses and I think I went deaf for a few moments before I stumbled through finding enough words in English to politely decline. For those of you who ride horses, I’m sure you think you could introduce me to your favorite horse and make me fall in love with him (or at least give him a carrot without breaking into a cold sweat). If you’re like me, afraid or maybe just ambivalent, I’m sure you’d agree that my life would be no less fulfilled if I never saw a horse again. So why ride a horse? And why do it now? I’ve been thinking about this fear thing for some time — years even. I fear growing old. I fear being alone. I fear failure. I fear success. I fear change, even though perhaps I fear a lack of change more. I’m afraid I won’t get what I want. How about this? I’m afraid I will get what I want. The thing is, those things are intangible. But horses are not. I can walk up to a horse and look it in the eye, feel the warmth of its body, wrestle with my anxieties and mount it. I should be able to do the same thing with my fears. I think that if I can drum up the courage to get on a horse, I can face down those other fears. I get that I shouldn’t have to ride a horse to master my other fears, but I like the idea of doing something physical, tangible…courageous. In the meantime, I am deeply consoled by this picture. It seems that once upon a time I wasn’t afraid. 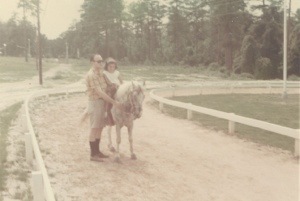 That’s my father in the picture, leading me on a little pony. I wasn’t afraid then, trusting my daddy implicitly, knowing he had the reins. I can learn a lot from that little girl…I can put my trust in my Heavenly Father, knowing He has the reins. He always has. Love this, Maria. I don’t know whether you should or shouldn’t actually ride a horse, but the image you give to fear and that sort of longing you have…priceless. Ok Girl, get a grip , hang on and go for that ride as you are already on that ride of a lifetime, you know what I mean ! Really enjoyed this post. The way you describe the fear thing really resonates with me. Thanks.